This is one of my favorite WordPress Themes so far. Vistalicious is a clean theme with two columns and a green flavored background. It is advertising ready and easily customizable. About Section: On the right side of the header you have space to write a brief description of the website, or to promote a specific section with a link to it. Subscription Section: The theme comes with a custom image to encourage visitors to subscribe to your RSS feed. It should be easy to insert an email subscription form there as well. Advertising Ready: The theme already comes with a 300×250 spot on the sidebar (compatible with Google AdSense). Additionally, there is a readme file with a code for people that want to use 125×125 ad buttons. If you find any problems while installing the theme, or if you have any suggestions, just let us know on the comments section below. @Tim, I don’t get what you mean by center the theme. You mean the text on the content column? Awesome theme, thanks! Got it up and running on my blog right now. Thanks again for creating these WordPress Themes, they are really great themes. You’ve got an RSS Subscriber for life! I’m stuck. The theme is left justified and I cannot get it to center. Any suggestions? I have downloaded the zip file and will try this in my new sites. I think it’s really cool, clean and easy to tweak. TY! Very nice theme! However, the end product is left justified instead of centered. I have not yet figured out how to center the sidebar and posts properly. Another nice design. Very refreshing. I like it. Thanks. I have downloaded the them for my blog and I love it. I am working on getting my logo in place in the header. I’m doing a little boning up on CSS. I will post once I finish, in case someone else needs the help. Very nice, although havn’t tried it out, I think the column for category might be a little bit too wide. its not bad.. Thought I don’t care for the color that much.. But I don’t mind the overall design of it. Thanks. I receive your rss feed daily after I found dailyblogs about a month ago. Installed WordPress just for another thing to play around with. After install I was stuck at what theme to have(takes longer to find one than install) this one ideal. Very nice. @Ultimate Blogging Experiment, email me and I will send you the psd. 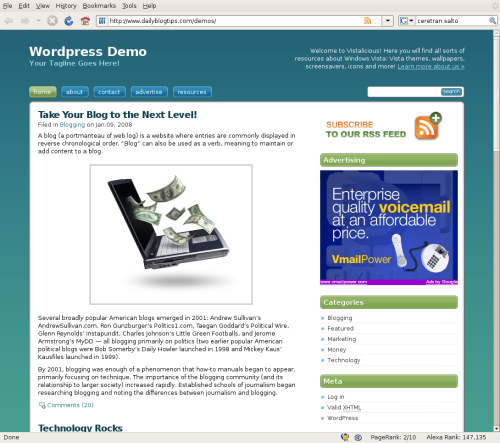 Do you have a psd file especially the Subscribe to rss feed Image? Also maybe add a banner next to the logo.? Thanks. Thank you for free nice theme. @Deblog, yeah you need to tweak it a bit to put AdSense on the header, but it is totally possible also. Awesome theme. Might use it and customize it myself. I am just here to say that it is a great free wordpress themes! OUTSTANDING!!! It really is very, very clean and slick! Just an FYI – the buttons at the top “break” if the title is too long. I shortened my page titles to make it work, that’s how great this is! Thanks!!! @DailyEcoTips, yeah right now you just have a 2 columns layout. We could try to do a 3-column version in the future though. Is it xtml or html customizable ?? That’s a refreshingly clean design. The simple background around the RSS icon is perfect for customising the subscription options rather than having to worry about matching gradient backgrounds. The only thing I don’t like is that it doesn’t appear to support 3 column layout. i like this theme ,thanks for shared!